Ok, so I like summer but there is such a thing as too much heat! So this week I made an escape to one of our country's favorite summer escape from the heat, BAGUIO CITY!!! Actually, the real reason I went there was because for a summer retreat. But what I didn't expect was the added bonus of the cool and sometimes chilly air that we had while we stayed here at Baguio City. So yeah, the temperature only became cool during the night and early morning, still it was so much better than the sweltering heat of manila throughout the whole day. While at Baguio, I happened to eat at 50's Diners at 92 Upper General Luna Road, Corner Brent Road, Baguio City. AND so far, this has been one of the best restos that I've eaten! Ok, so the ambience still needs some improvement but it has all the elements of a 50-ish diner. It has a LOT of posters of old Hollywood stars like James Dean, Rita Hayworth, etc. And of course, old movie posters like CASABLANCA, The Attack of the 50 ft. Woman, Psycho, etc. Then there's a jukebox in a corner (I'm not sure if its working though), neon pink lights, and all the waiters and waitresses wearing the appropriate costume! But I guess the best feature was the food. It was delicious, huge serving, AND most importantly super affordable!!! I mean, this beats all fastfood servings and prices! 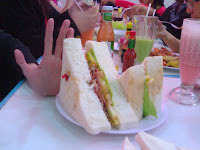 When I went there, I was with a group of friends and workmates and we ordered a lot not knowing of the huge servings! And boy were we shocked by the amount of food served and the total cost of it all. I ordered a Fish Fillet Sandwich (which I think costs 95 pesos) and my bestfriend ordered TLB Sandwich (80 pesos) and both sandwiches had french fries on the side. The fries weren't even the commercially and artificially made ones but actual potato slices that were deep fried. The food was perfect! We also had a real strawberry shake -- coz you can't go to Baguio without having a taste of strawberry here and there. And I loved it! It only cost us like 70 pesos. Overall, I rate this restaurant with 5 Stars! 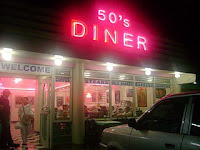 So if you do ever go to Baguio, don't forget to drop by the 50's Diner for an awesome and affordable food experience.